Compensatory (or "comp") time is time off from work in compensation for irregular or occasional overtime work, substituting for overtime/time and a half pay. It is only available to state and local government employers, both exempt and nonexempt, through a 1985 amendment to the Fair Labor Standards Act (FLSA). The rate of comp time under FLSA must be one and one-half hours granted to the employee for every hour he/she works over forty hours in a single week. Employees may bank their comp time to a particular cap or maximum, and accrued time is paid at termination. Problem in the public sector. Employees accruing large amounts of comp time has led to problems for some public employers, because it meant that at an employee's termination the agency had to pay for a significant amount of banked time, and the cost could be very high. Public employers began to require employees to take the time off in order to reduce banked time, and employees sued, charging the employers with violating the FLSA. The issue finally went to the U.S. Supreme Court, in Christensen v. Harris County, 529 US 576 (2000). In Christensen, deputy sheriffs sued the county for their implementation of a policy requiring employees to use accumulated comp time. The sheriffs alleged that the county's policy violated the FLSA's requirement that there be an agreement between employer and employees as to when the time should be taken. The Supreme Court said otherwise. Employees may choose whether they want comp time or overtime, said the court-but if they choose comp time, and bank it, employers may mandate when (or by when) the banked time must be used. The FLSA does not bar an employer from specifying when compensatory time must be taken nor does it bar employers from reducing the cost of accrued comp time by "cashing it out" and paying the employees time-and-a-half for it. Compensatory time is not available to private sector employers. During the 1990s a number of bills were proposed that would have allowed for use of comp time; but although all passed the House, they were killed in the Senate. Labor opposed (and lobbied heavily against) the bill because they believed employers could and would dictate when the leave time could be taken, and/or pressure employees to take the time instead of overtime pay. Workers testified before Congress against the bill, including many seasonal workers who said they needed the overtime pay to make up for periods when there was little or no work for them. Workers also testified that they were under a lot of pressure to work overtime and since they had to do so, they wanted to be paid for it. Another objection was that an employer could choose to assign overtime work exclusively to workers who chose comp time instead of overtime. This year's bill also died in the Senate, opposed by most Democrats and some Republicans. Some employers in the private sector, unaware of the laws against it, informally adopt a comp time policy-giving employees an hour at some later time, for an hour of overtime work. If only one employee complains to the Department of Labor about the practice, an employer may find him or herself paying all employees for the time worked over 40 hours and half-time pay as well. If the employer has not kept good records, the time will simply be estimated. 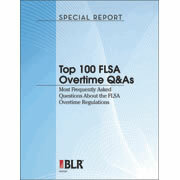 Violating the FLSA overtime rules can be a very dangerous error. There is, however, a way for employers to offer employees time off instead of money for extra hours worked. If your state has a weekly, rather than a daily overtime standard, an employer might arrange for a worker to work four 10 hour days and have three days off a week. Thus, the worker would work 40 hours a week and not need to be paid overtime. If an employee works more than 40 hours a week, a private employer might arrange for comp time if the time off is taken within the same pay period as the overtime work.